The overall avalanche danger is CONSIDERABLE today. HUMAN TRIGGERED AVALANCHES ARE LIKELY TODAY. Slopes steeper than 30 degrees especially where the wind has been drifting snow are likely places to trigger an avalanche again today. The Skyline picked up a couple of inches of snow out of last nights minor weather disturbance. Riding conditions remain good to excellent. Don't let this cloud your judgment for avalanche safety!! We'll see increasing southwest wind today with high temperatures around 20 degrees and increasing clouds this afternoon. Another weather impulse will move through tonight bringing perhaps 3 to 5 inches of new snow by Monday morning. The long term weather outlook looks active with weather models advertising lots of snow coming later this week. While training with Search and Rescue crews on Saturday, a number of us experienced collapsing of the snowpack. This is when the snowpack makes a loud "WHOOMP" and you may feel the snow settle rapidly underneath you. This is a BIG RED FLAG for avalanche danger. We were also able to still produce clean shears and full propagation in snowpit tests. In other words, snowpit tests results showed poor stability. This is all caused by buried weak layers of sugary snow deeper in the snowpack. Until we see less avalanche activity and less collapsing and start seeing better results in our snowpit tests, this buried weak snow remains a serious concern. The southwest wind is supposed to increase today which will drift all the loose powder snow. Slopes that are on the east half of the compass are the most likely places to see fresh drifts form. These drifts are often the most sensitive when they are forming and directly after they've formed. 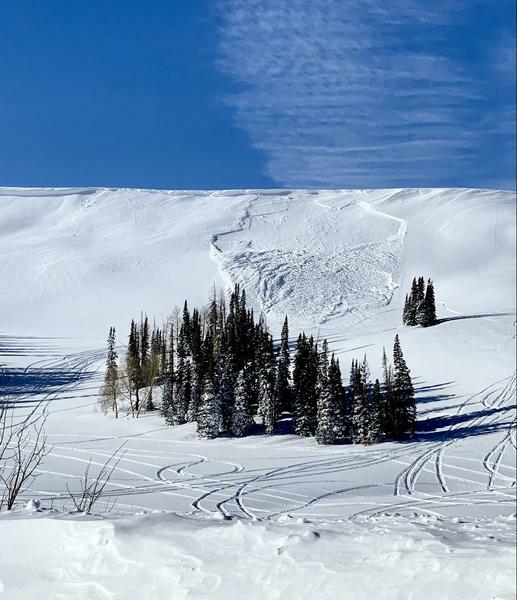 The photo below is a natural avalanche that released due to wind drifted snow. It was northwest of Huntington Reservoir. Photo submitted by Calan Cook.